Sea shanties and tales have been spun since the dawn of man about horrific creatures in the sea terrorizing ships and eating crew members right off the decks. While many assumed that these were just the tales of yore with no fact to them, it turns out there may be some truth to these stories after all. An ultra-rare frilled shark — which has a body shaped like a snake and a head like a shark — was recently spotted and captured off the Algarve coast, Portugal’s southernmost region, according to The Sun. Images of the shark have been causing a stir on social media. The creature, measuring 4 feet 9 inches, belongs to a species that dates back 80 million years, coinciding with the peak of the dinosaurs. Humans have come across this shark just a handful of times before, including the first observation in August 2004, off the coast of the southeastern U.S. The one spotted in Portugal waters was captured at a depth of 2,300 feet below the surface. Previous encounters with the frilled shark have been around this depth, though not below 3,300 feet, due to its habitation near the outer continental shelf and upper to middle continental slopes. Other sightings include one in January 2007 in Japan, December 2014 in Australia and one in Tokyo Bay in April 2017, when the creature was captured on film, according to Japanese news website Mantan. Other than its habitat and appearance, there is little known about the frilled shark, since it had never been captured before. In an interview with Portuguese news website Sic Noticias, University of the Algarve professor Margarida Castro said its name is derived from the way its 300 teeth are arranged. 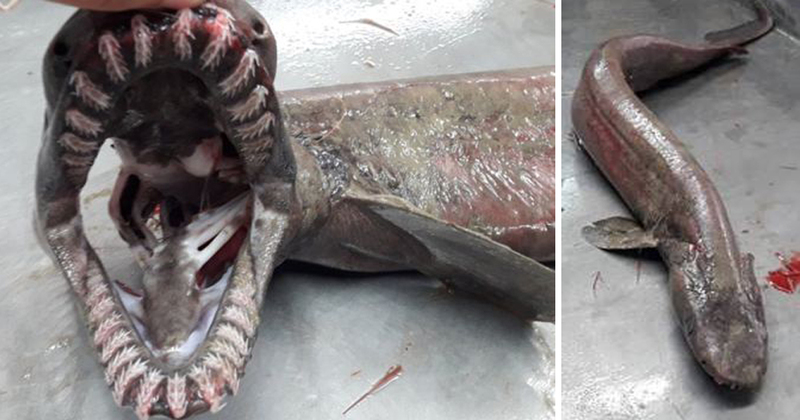 During an offshore trawl in southern Portugal earlier this year, researchers caught a bizarre deep-sea animal: a frilled shark. The one-and-a-half-metre male shark was pulled up near the Algarve region back in August, but the discovery began grabbing headlines this week. Some of the details accompanying the story, however, aren’t entirely accurate. The male shark was caught by trawlers in August. Images: IMPA/MINOUW Project. The frilled shark (Chlamydoselachus anguineus) belongs among the world’s more primitive shark species. It sports a ruffled throat and lizard-like rounded head, characteristic features from our oceanic past that are seldom seen today. Just how “unchanged” these sharks remain, however – and exactly when they first arose – is still up for debate, and claims that the species is “one of the most archaic animals on earth” are a bit misleading. Some scientists believe these animals hail from the late Jurassic period (up to 165 million years ago); others suspect this number should be halved (which would place the sharks in the upper Cretaceous), but the species we see today could be far more recent. Shark skeletons are made of cartilage and therefore don’t fossilise well, so most of what we know about their ancient kin comes from their mineralised teeth. Only around ten Chlamydoselachus shark fossils exist on record, and while the oldest tooth in that bunch dates back about 85 million years, the animal it belonged to was only a predecessor to the modern frilled shark. Many reports have suggested that this shark is “one of the rarest animals on the planet“, which is also not quite accurate. The frilled shark has been spotted in over 20 countries, including Arctic Norway, New Zealand, both US coasts, Japan and Chile. The species is occasionally sold in fish markets in Japan, and taken accidentally by trawl and gillnet fisheries worldwide. “Frilled sharks are not really that unusual from the eastern North Atlantic,” says Pacific Shark Research Center director Dr Dave Ebert, who managed to catch 28 of the strange animals last March during a research trip in Tokyo Bay. “We were actually out looking for, and successfully tagged, some goblin sharks, another weirdo! I love these lost sharks,” he says. The frilled shark’s susceptibility to bycatch led the IUCN to list the species as “Near Threatened” back in 2003, and this threatened status has been widely cited since the Portugal sighting. However, a more recent evaluation showed that the animal’s preferred habitat – up to 1,500 metres (4,900ft) beneath the surface – puts it beyond the reach of trawl fishermen, due to trawling depth restrictions in many countries across its range (Australia and New Zealand, for example.) For this reason, the frilled shark has been re-listed as a species of “Least Concern”. What is true is that frilled sharks are only rarely seen alive in their natural habitat, and the recent sighting is no exception, despite reports that the animal was “found swimming”. According to Dr Margarida Castro, a professor and researcher at the Centre for Marine Sciences at Portugal’s University of Algarve, the shark wasn’t alive when it was pulled from the trawl net. Castro is part of the EU MINOUW Project, which aims to develop tools for reducing bycatch and unnecessary waste in European fisheries. 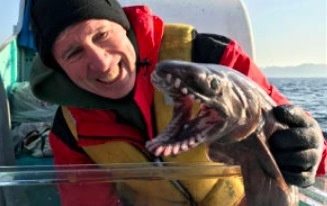 It was during one of the project’s test trawls that the frilled shark was found. Very little is known about the creature’s ecology, but we’re slowly starting to understand its place within the food web. Scientists used to think these animals were too slow to capture quick prey, but a study in Japan’s Suruga Bay showed that the sharks like to dine on both squid and bony fishes. Behind the animal’s eerie “grin” lurk 300 trident-shaped teeth, laid out in about 25 rows. “They are very sharp, thin and point in,” explained Castro. “This allows them to catch large prey and not let it escape; the teeth prevent prey from leaving the mouth. It’s clearly a very apt predator.” Those recurved teeth are among the many features that give the species its Latin name, which, roughly translated, means “snake-like”. The teeth are so effective, in fact, that a frilled shark is able to hunt prey as large as half its own body length. And unlike many deep-sea animals (such as the flabby “sofa shark”), frilled sharks are quite muscular. Scientists suspect they may be able to lunge-strike, a move similar to what you’d expect from a terrestrial serpent. What’s more, according to Ebert, the bright white colouration of the teeth may help lure in their food against the dark backdrop of the deep sea. “By the time [prey] realise, oh, that’s the teeth of a shark, they’re too close and the shark is able to ambush them at that point,” he said. “It’s almost like when you drive out of a parking lot exit and they have the spikes sticking out that say, ‘Do not back up.’ That’s kind of what happens when these things catch prey items.” This could also explain why the sharks tend to swim with the mouth agape. The footage is one of a kind, and it will likely be some time before another clip emerges to surpass it. That’s because frilled sharks almost never venture into waters shallower than 20 metres. And when they do, it’s usually a sign that something is very wrong with the animal. Japan’s Awashima Marine Park attempted to house a frilled shark in 2007 after it was found lumbering through a nearshore bay. That animal was thought to be sick or injured, and it died mere hours after capture. Because we don’t really know how many frilled sharks are out there, it’s critical that every catch – incidental or otherwise – is recorded. Whether or not the Portuguese specimen was kept for study remains unclear, but we’ve reached out to MINOUW for more information. We’ll update this article as we learn more, so be sure to circle back.